Clive said he was delighted with the rapid progress the constructors had made in the last year. “I have been working for so many years to get to this stage” Clive said after the ceremony, “I am delighted that the project is on budget and on schedule to open next year. This location is ideal and its excellent public transport links means that it is accessible for all the community”. Clive is pictured, right, with Mark Tant, Managing Director of the contractors Willmott Dixon. The centre has three swimming pools. The new eight lane main pool will be competition standard which means it will be a venue for accredited swimming galas that currently cannot be held at Eltham Pools. Greenwich Community College has also invested in the scheme and will occupy two floors in the new building. The library will also get a £1.7 million refurbishment and the centre will be a one-stop-shop for council services. The town centre location was chosen by local people following an extensive consultation. It will be easily accessible by all members of the community, even those without a car. Clive attended a site meeting in Eltham Park North with the local police Safer Neighbourhood Team, the Eltham Park Residents Association and council officers in an attempt to find a way to tackle antisocial behaviour in the Park. Clive joined thousands of local people when he turned on the Christmas lights in Eltham High Street. “This event gets bigger and better every year” said Clive. “I want to congratulate everyone who did so much to make this a night to remember”. As well as a lantern-lit procession of local school children there were jugglers, dancers on stilts and even fire breathers. There was also a stage highlighting local musical talent. After the parade there was a spectacular firework display from the roof of Marks and Spencers. Clive has sent a message to the Government calling for a ban on the UK import of seal products. He was one of over two hundred MPs who signed a motion in the Commons calling for the ban. He is also urging people in Eltham and Plumstead to voice their opposition to the trade in products from Canada’s commercial seal hunt, which is now bigger than it has been for 50 years. Clive met campaigners from the International Fund for Animal Welfare (IFAW) at the Labour Party Conference in Manchester in September and saw their stand, which graphically illustrated why Canada’s cruel and unnecessary seal hunt must end. 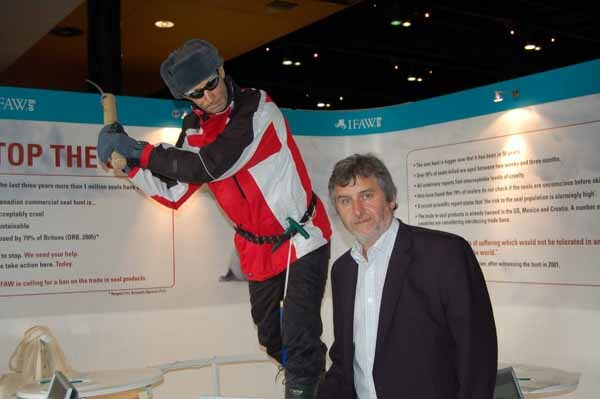 A life-size animatronic sealer wielded a hakapik (a spiked club used by sealers to kill seals) while footage captured by IFAW at this year’s seal hunt was played. IFAW opposes the seal hunt on the grounds that it is cruel, unnecessary and unsustainable. More than one million seals have been killed over the last three years alone. The majority of seals killed are pups aged between two weeks and three months, and all veterinary reports have documented unacceptable levels of cruelty. Clive has visited a number of schools to give his presentation about climate change. After launching his campaign at Eltham Hill (for more details click here), Clive has been to Riverstone and Crown Woods. As part of Clive’s presentation he lists the 10 Steps to Save Energy (click here) as well as talking to students about the cause of global warming and some of the solutions. As well as the presentation Clive has worked with local schools to send thousands of letters to parents and pupils explaining how to save energy and cut bills.